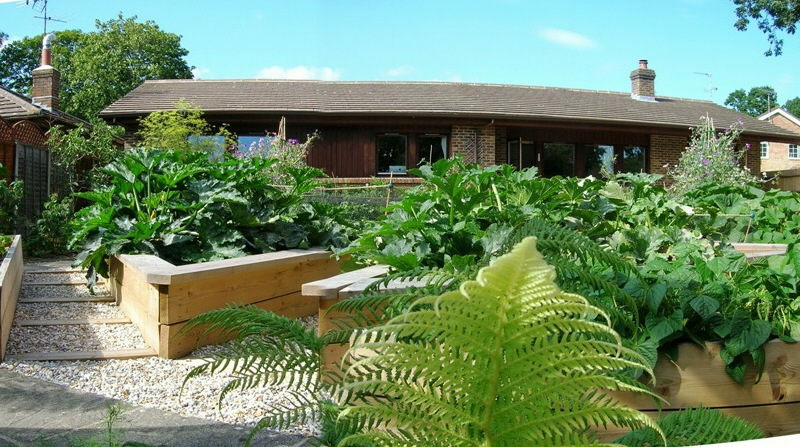 Southwater – a multi-functional garden to complement a modern house. 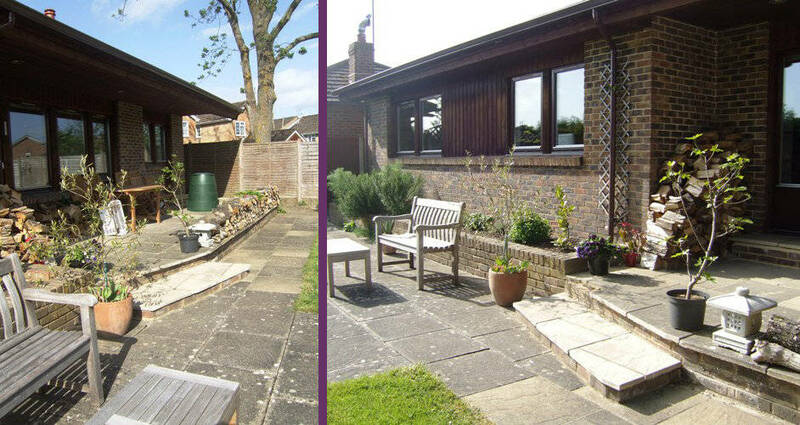 Our clients had recently left their busy lives in the academic world and moved to a sleek, low-slung, modern house in Southwater to enjoy a well-earned and active retirement. For the interior of their new house, they favoured the clean, cool style that is typical of Scandinavia and Germany, with spare, elegant forms and a neutral, naturalistic colour palette. But the garden as they acquired it was almost completely undeveloped, with the major part given over to a blank, featureless lawn. The terrace was rudimentary and barely functional. Our clients, already experienced and enthusiastic gardeners, had clear ideas about what they wanted and they were eager to realise a garden that meets their various functional needs in a way that provides maximum visual appeal in an effective and efficient, compact, low-maintenance format that is also kind to the environment. We produced a design (executed by the client’s own landscaper) that met their requirements comprehensively. The entrance to the garden is by way of a terraced seating area, sheltered by the generous eaves of the house. 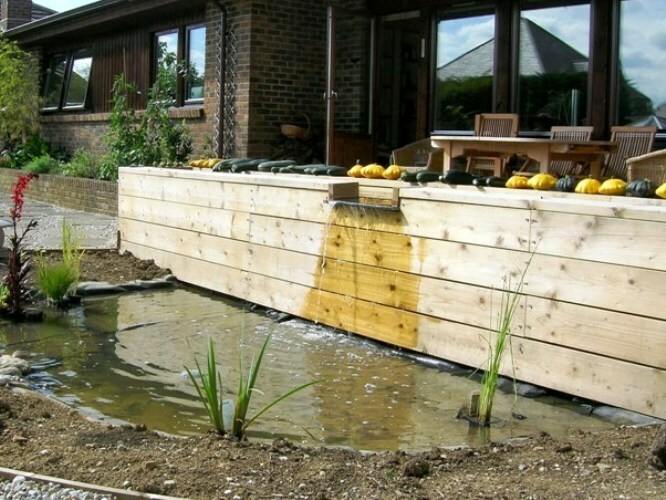 The terrace is bordered by a raised rill, with a soothing cascade to a pond beneath, which is adapted to create an attractive environment for wildlife. From the terrace, a flagged apron leads to the other areas of the garden. To the left, there is a sunken, circular seating area, perfect for catching the morning sun. To the right is a west-facing seating area, which is in full sun from mid-day onwards. 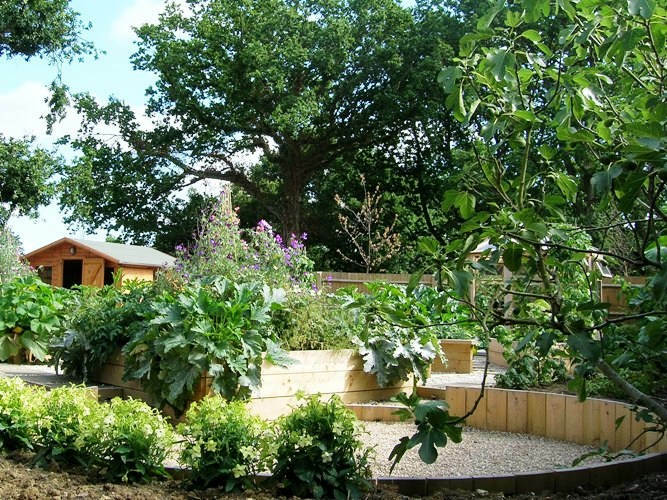 And straight ahead, the apron gives on to a highly productive vegetable garden, based on a geometric set of raised beds with a greenhouse at their heart. The compact layout is rounded off by a gracefully curved lawn. The wood and stone used were chosen carefully so that they tone in with the house and its interior colour scheme, whilst being good value and durable. 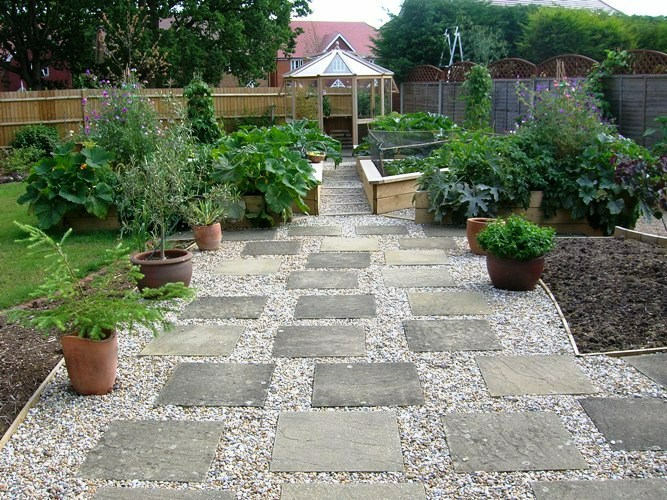 The variety of geometric shapes employed in the garden adds plenty of visual interest. They harmonise with the house, creating a setting that emphasises the house’s clean, simple lines. The house seen from the vegetable garden. The same view when we first arrived. The almost unrelieved flat lawn holds little interest of itself, yet it conspires utterly to dominate the house, which seems to shrink in response. The existing terrace skulks around the house, looking sullen. We relish challenges like this! The terrace before: unusual angles. These existing steps had clearly been added later to the original terrace. The choice of materials and the unusual angle was visually jarring … and their irregular heights gave the experience of using them similar qualities. However, removing the steps entirely would have been prohibitively expensive, so we decided to incorporate their geometry into the new design. This created an exciting opportunity to align other new features accordingly, and we soon recognised that we should lay the garden out not to a conventional orthogonal grid, but to an alternative grid based on the offset steps. Under construction: the vegetable garden. 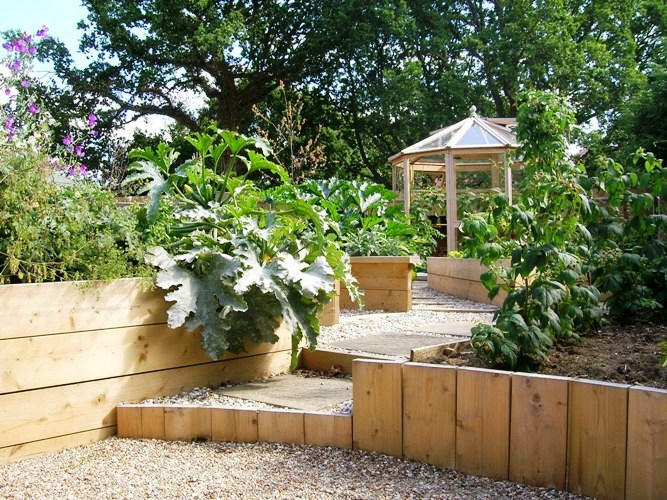 We have already mentioned the virtues of raised beds in a garden like this, and here they have an extra advantage. Southwater has long enjoyed an historic association with brick and tile manufacturing, the origins of which lie in the excellent clay that is found throughout the area. Unsurprisingly, the soil in this garden was also heavy clay – no doubt excellent for brick-making but not even remotely suitable for growing vegetables. Without the raised beds, someone would have been in for back-breaking digging and soil conditioning. With the raised beds, we could simply fill them to the brim with our secret recipe clay-breaker (well-rotted manure) and let the worms do the hard work. The flourishing greenery that soon followed affirms vividly the success of this approach. Under construction: the sunken seating area. Careful attention to inexpensive but effective drainage was crucial to ensuring that the sunken seating area does not become an impromptu pond every winter. Once again, liberal application of our patent clay-breaker helped to condition the soil, so that new planting established quickly and thrived. To the benefit of costs and the environment, we re-used the flags salvaged from the earlier terrace to create this apron. It forms a kind of atrium in the new garden, a central space through which all of the other areas of the garden can be reached. Detail: towards the green house. The multi-faceted green house was chosen to provide maximum working space in a compact envelope. Its wooden structure tones in with the rest of the hard landscaping. Here it can be seen through the vegetable garden from the sunken seating area. The harmony between these three distinct functional areas of the garden is very apparent. Detail: the sunken seating area. Even before the seats arrive, this area is already looking established. The thriving plants are nicely blurring the formal geometry to make a welcoming look-out from which the rest of the garden can be viewed in comfort. Detail: the rill seen from the house. 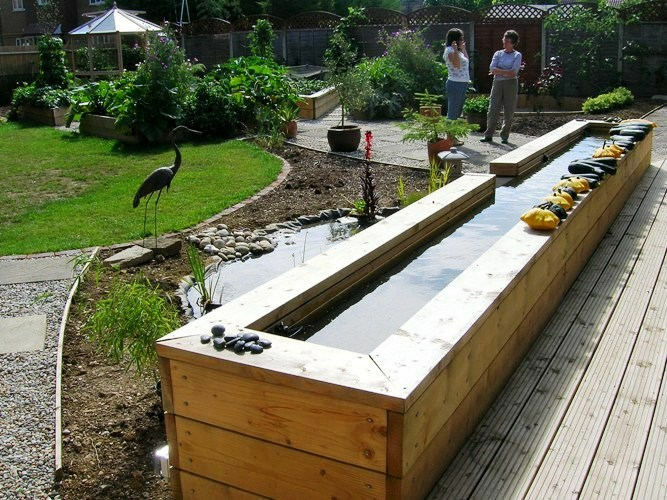 The rill has been created in timber that matches the other structures. It is arranged so that water flows gently from each end towards the centre, where it cascades over the weir. The flow is managed to create just a hint of surface movement, so that plants and fish will not be unduly disturbed. Detail: the wildlife pond beneath the rill. The water cascades from the rill at a rate calculated to make a pleasant, gentle sound, but without churning the water in the small pond below. At the time, the pond margins were still awaiting planting with moisture-loving species that will accommodate any overflows at times of heavy rainfall.